2015 was not the best of years, but it certainly had its moments…most of the good ones involved music. Here are a few of the songs that had an impact on my year. Another very highly anticipated debut album, Meg Myers’ Sorry was released this year. I first heard the album’s title song at a festival in San Diego and it was an instant classic, capturing all that I love about Meg Myers’ brand of visceral rock. I was only able to see Meg once since the release of the album, but she continues to dominate the stage putting on one of the most emotionally compelling performances. 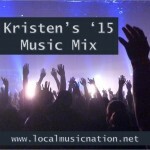 Posted in Music Mixes and Best Of Lists on December 26, 2015 by Kristen.